‘Balak Balak’ he called out loudly several times. I wandered what was he saying, till I finally realised he was shouting for me to move out of the way of the approaching mules laden with goods. I’m in the medieval 9th century Fes medina – Fes el Bali, the largest no car zone in the world. Here time stands still and I am transported back several centuries. 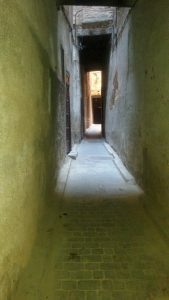 As we walk past the old stone wall bordering the Medina, the lanes narrow and a labyrinth of twisting alleys branch out enticing us further into the maze. We walk single file, in a narrow 1 meter lane, centuries old houses on either side. I am enchanted! The medina is 1200 years old, with 9000 narrow lanes, home to around 200000 people with plenty of riads, mosques, mederasas, industries, schools and gardens. Each quarter of the old medina has the essential five: Mosque, Mederasa, Bakery, Fountain and Hammam. I can shop, eat, pray and live the rest of my life here, without once having to venture out. We started by walking past the old medieval houses, some very elaborately decorated doors, almost all having a Fatima Hand placed on the door for good luck. As I walk around, my curious eyes absorb as much as I can. Children playing games, women preparing couscous and men going about their trade. I am amazed at the drainage system put in place several centuries ago and still functioning efficiently. We moved towards the sections of craftsmen. 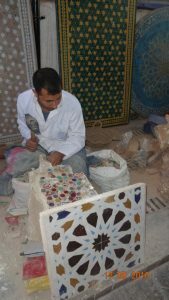 There are over 30000 artisans in the medina. Mosaic sculptures, blacksmiths, wood cravers, silk weavers, leather tanners. Each guild occupies its own section and has its own souq. We stopped at a few, to appreciate the skill and dedication of the artisans while sipping on plenty of sweet mint tea. Those fluent in English explained to us the hardwork, effort and hours that go into making a single product many of which are then exported across the globe. 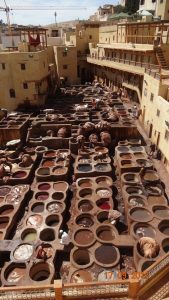 At the leather tanneries, we mounted the first floor of a leather souq terrace overlooking the leather vats. Each of us was given a fresh mint stock to breathe into lest the pungent odour of the vats gets us nauseous. The skins of sheep, goat and camel are treated using liquid lime, pigeon poo and cow urine. They are then lowered into dyeing vats and the workers follow, kneading the leather with their feet so that the colour is absorbed fully. The dyed skins are then brought by mules to nearby rooftops, and hills and spread to dry in the sun. We continued walking past different quarters of the medina. Each time I greeted someone with the traditional Salam Alaikum, I was answered with ‘Shukriya’, or ‘You from India’, adding to my excitement and delight. I soon discovered Moroccans to be huge Bollywood fans and felt instantly at home. By now, quite famished, finding a riad styled restaurant in the heart of the Medina, I gorged on lamb tagine with prunes. The meat was tender and succulent with just the right amount of spices. Renewed with energy, I once more wandered around getting lost in the secrets of the medina’s narrow alleys. As I walked past, I slipped into a daydream, picturing myself living in a beautiful riad in the medina, growing up with the neighbourhood kids and becoming a mistress of the crafts. ‘Balak Balak’ he continued till I was jerked out of my dream and quickly moved to what could possibly be called the side of a narrow lane, to give way for him to get along with life. Whatever the future might hold for Morocco, one thing is certain, life in the old Fes medina will continue the way it has these past 1200 years. As I leave the bustling souq and make my way through the dimming light, the soulful cry of the Muezzin calling to prayer rings out from mosques all around. One after the other, they began, melody, a chorus, an ensemble. Everything felt surreal. I knew I would be back again. Where to Stay: There are plenty of hotels to choose from in Fes. But for an authentic experience, book yourself into a traditional Riad in the Medina. 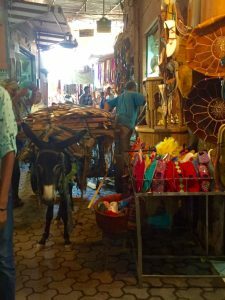 Best Time to Visit: While Fes can be explored all year round, in summer the temperature reaches high degrees. Stay hydrated, wear cotton, loose clothing and a hat. Previous Post:10 Fun Facts about Christmas Traditions !